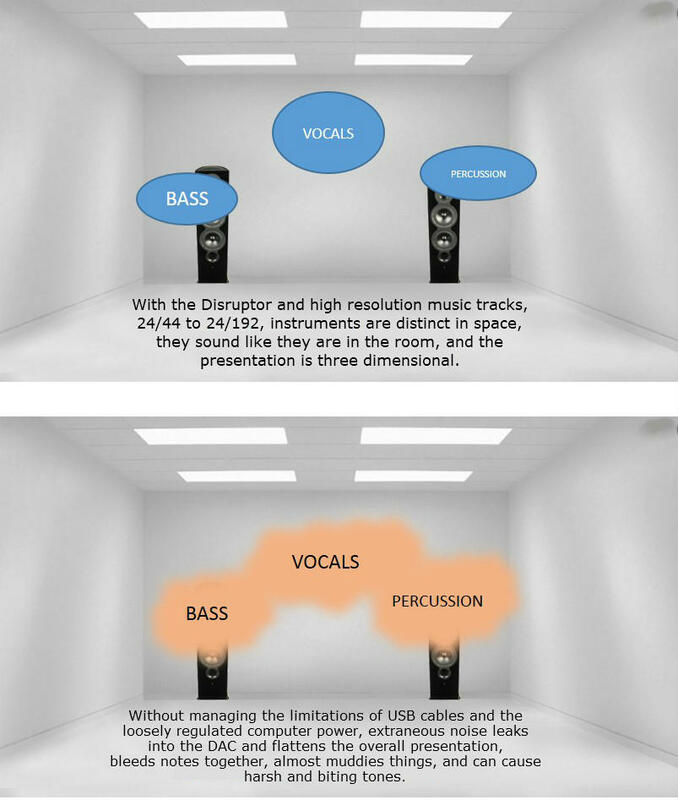 Truly hear your high-resolution audio files. 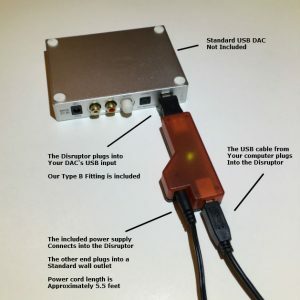 USB Disruptor optimizes USB DAC’s. Computers and computer-like devices create noise and interference from the normal activity of the various electrical components that compose a computer. Hard drives, screens, power supplies, memory, etc., all draw current and cause power spikes, and in turn create noise. USB cables are not optimized for high resolution audio streaming. Not only do they carry the noise generated in the computer to the USB DAC, they align the power wire inside the cable to the digital signal lines. The signal lines are intertwined with the power line, and electromagnetic interference from the power line affects the cadence of the digital stream. In addition, the metal mounting hardware of the USB cable can pass a current. This allows more electrical interference to work its way into the USB DAC. It’s a poor design for high resolution USB audio.The combination of noise from the computer and the flawed USB cable design affects the sound of USB audio in subtle though impactful ways. Technically speaking, high resolution USB audio should be the best sounding of all sonic mediums. It’s the most data dense of all digital mediums. However, many audiophiles report getting better sound with vinyl, SACD’s, and CD’s. And that is because USB is not optimized for audio. The physical separation of the power flow from the USB cable eliminates negative effects on the digital signal lines during signal transfer from computer to DAC. The power from the computer is cut out of the loop and replaced with a virtually noise free external power source to cancel any negative effects of loosely regulated computer power. The conductive metal mounting hardware of the USB cable is deactivated to prevent computer noise and other extraneous noise from leaking into the DAC.